A protocol for the concurrent quantification and comparison of three cellular and extracellular components within biofilms is presented. The methodology involves the use of confocal laser scanning microscopy, biofilm structural analysis and visualization software, and statistical analysis software. Khajotia, S. S., Smart, K. H., Pilula, M., Thompson, D. M. Concurrent Quantification of Cellular and Extracellular Components of Biofilms. J. Vis. Exp. (82), e50639, doi:10.3791/50639 (2013). Confocal laser scanning microscopy (CLSM) is a powerful tool for investigation of biofilms. Very few investigations have successfully quantified concurrent distribution of more than two components within biofilms because: 1) selection of fluorescent dyes having minimal spectral overlap is complicated, and 2) quantification of multiple fluorochromes poses a multifactorial problem. Objectives: Report a methodology to quantify and compare concurrent 3-dimensional distributions of three cellular/extracellular components of biofilms grown on relevant substrates. Methods: The method consists of distinct, interconnected steps involving biofilm growth, staining, CLSM imaging, biofilm structural analysis and visualization, and statistical analysis of structural parameters. Biofilms of Streptococcus mutans (strain UA159) were grown for 48 hr on sterile specimens of Point 4 and TPH3 resin composites. Specimens were subsequently immersed for 60 sec in either Biotène PBF (BIO) or Listerine Total Care (LTO) mouthwashes, or water (control group; n=5/group). Biofilms were stained with fluorochromes for extracellular polymeric substances, proteins and nucleic acids before imaging with CLSM. Biofilm structural parameters calculated using ISA3D image analysis software were biovolume and mean biofilm thickness. Mixed models statistical analyses compared structural parameters between mouthwash and control groups (SAS software; α=0.05). 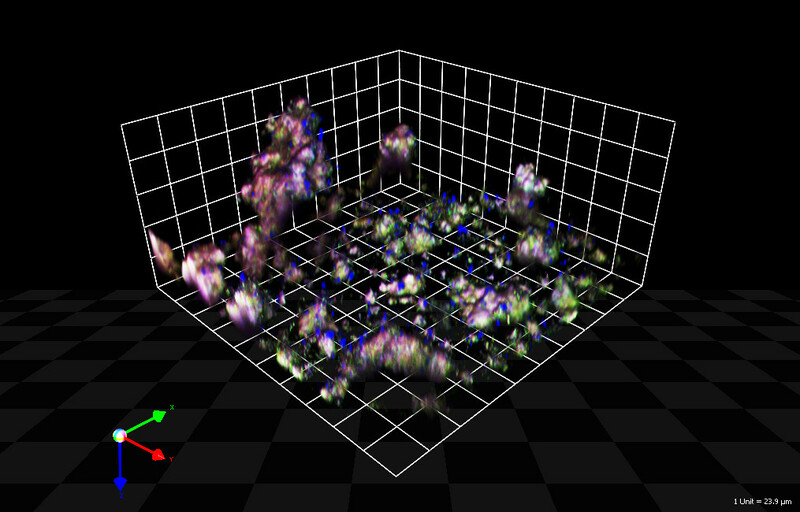 Volocity software permitted visualization of 3D distributions of overlaid biofilm components (fluorochromes). Results: Mouthwash BIO produced biofilm structures that differed significantly from the control (p<0.05) on both resin composites, whereas LTO did not produce differences (p>0.05) on either product. Conclusions: This methodology efficiently and successfully quantified and compared concurrent 3D distributions of three major components within S. mutans biofilms on relevant substrates, thus overcoming two challenges to simultaneous assessment of biofilm components. This method can also be used to determine the efficacy of antibacterial/antifouling agents against multiple biofilm components, as shown using mouthwashes. Furthermore, this method has broad application because it facilitates comparison of 3D structures/architecture of biofilms in a variety of disciplines. Biofilms are structured microbial communities that are encapsulated in a self-produced extracellular matrix, and are attached to biological or inert surfaces1. Biofilms represent a common lifestyle for many bacteria, and form by transitioning in stages from free-floating (planktonic) cells to complex multispecies communities. The inherent resistance of biofilms to antimicrobial agents is at the root of many persistent and chronic bacterial infections1,2, as demonstrated by oral biofilms (dental plaque). Cariogenic microorganisms such as mutans streptococci process sucrose and other carbohydrates to produce an extracellular matrix and generate acids that can demineralize tooth structure and cause dental caries. Most biofilm matrices are biopolymers consisting of cellular and extracellular components such as exopolysaccharides (EPS), proteins, and nucleic acids3,4. Confocal laser scanning microscopy (CLSM), the most widely used technique for fluorescence imaging, has radically transformed optical imaging in biology because it has the ability to collect 3D images of hydrated biological structures without fixation5,6,7. This nondestructive technique involves collecting images of thin sections within a region of interest on the specimen in such a manner that the contribution of out-of-focus light is removed. The quality and resolution of images captured by CLSM is beyond what is achievable using widefield fluorescence microscopy. One major drawback of CLSM is that scanning of images occurs at a slower rate than with widefield microscopy techniques, in which entire images are collected simultaneously5. However, with a widening selection of fluorochromes, lasers, and filters, CLSM has become one of the prevailing techniques for multispectral imaging5,7. Previous studies have shown CLSM to be a useful tool for examining the structure or architecture of biofilms by using one or two fluorescent tags or stains to provide a better understanding of the distribution of EPS and cells within biofilms, and especially within the extracellular matrix7,8. In theory, fluorescent staining/labeling of multiple components is desirable for exploring the detailed structure and colocalization of cellular and extracellular components within biofilms. However, concurrent analysis of various components within biofilms can be challenging because: 1) selection of fluorescent dyes having minimal spectral overlap is complicated, and 2) quantification of multiple fluorochromes poses a multifactorial problem. Colocalization using multiple fluorochromes requires the use of highly specific stains with minimal spectral interference to avoid any bleed-through effects, which occurs when two fluorochromes have significant overlap in their spectral peak, causing one to be more strongly excited than the other9. Ideally, fluorochromes having excitation spectra that do not overlap would provide the best results, however it is very difficult to find stains that meet this criterion. Instead, the selection of stains is optimized by choosing fluorochromes whose emission spectra have minimal overlap, allowing the stains to be viewed one by one within a limited observation wavelength band9. Superimposition of fluorescence images is probably the most widely used method for evaluating concurrent distribution of fluorochromes. Colocalization of the various components appears as an overlap of different colors through multiple channels created by the fluorochromes being examined10. The tools for displaying multiple-channel fluorescence images as merged color images are available in most CLSM software and biological image analysis software. Although superimposition of images is useful for spatial evaluation of colocalization, the images can only be examined qualitatively by visual analysis. This provides a limited amount of information, as these representations are generally not helpful for quantifying colocalization under different experimental conditions nor do they determine whether the colocalization exceeds random coincidence11. Very few investigations so far have used quantitative methods to analyze the 3-dimensional structure of biofilms and biofilm components, and even fewer have quantified the effect of antibacterial treatments or antifouling measures on biofilm components. The objective of this study was to report a methodology for quantification and comparison of the concurrent 3-dimensional distributions of three cellular and extracellular components of biofilms. The method consists of distinct but interconnected steps involving biofilm growth, staining, CLSM imaging of biofilms, biofilm structural analysis and visualization, and statistical analysis of structural parameters. The biofilm growth assay permits biofilm growth on relevant substrates, and produces biofilm structures that are reproducible. The combination of novel simultaneous staining of EPS, proteins and nucleic acid components with the measurement of 3D biofilm structural parameters results in quantifiable distributions of components within biofilms. Statistical analysis of the biofilm structural parameters facilitates evaluation of biofilms under specific experimental conditions (e.g. after treatment with mouthwashes), as will be described in the next section. Make 300 ml overnight culture medium (THY; 3% Todd Hewitt Broth prepared according to manufacturer's instructions supplemented with 0.3% Yeast Extract in ultrapure water) and autoclave. Store at room temperature for up to 2 months. Make 1 L THY agar (3% Todd Hewitt Broth, 0.3% Yeast Extract, and 1.5% agar in ultrapure water), autoclave, and cool to 60 °C before pouring into Petri dishes. Store at 4 °C for up to 3 months. Make 150 ml biofilm growth medium (0.5X TY supplemented with 10 mM sucrose; 1.5% Tryptone, 0.5% Yeast Extract, and 10 mM sucrose in ultrapure water) and filter sterilize. Store at room temperature for up to 1 month. Make 1 L Phosphate Buffered Saline (PBS; 8 g NaCl, 0.2 g KCl, 1.44 g Na2HPO4, and 0.24 g KH2PO4 in ultrapure water) and autoclave. Store at room temperature for several months. Make 600 ml 10 mM Tris HCl buffer supplemented with 10 mM CaCl2 in ultrapure water (TC buffer; pH 7.2) and autoclave. Store at room temperature for several months. Autoclave 1 L ultrapure water. Store at room temperature for several months. Fabricate disk-shaped specimens of Point 4 (PF) and TPH3 (TP) dental resin composites in a custom-made stainless steel mold in two increments. Each increment is light-cured for 40 sec using an LED light-curing unit. The two products have slightly different compositions and filler levels, and thereby produce different surface topographies upon which the biofilms will be grown. Specimens of relevant substrates could be fabricated using established protocols from other disciplines in lieu of step 2.1. Finish and polish specimens to an acceptable final surface finish, e.g. by using a semi-automated grinder-polisher. Rinse polished specimens with ultrapure water and dry using compressed air. Sterilize specimens using ethylene oxide gas or an alternate sterilization method. Inoculate a single colony of S. mutans into 4 ml overnight culture medium (step 1.1). Incubate overnight at 37 °C for 16-18 hr. The optical density (OD600) of the culture should be ≥0.9. It is best to use a colony from plate cultures that have been passaged 2x from an original stock, as this results in more consistent biofilm growth. Create a 1:100 dilution using the overnight culture (step 1.1) in 10 ml of biofilm growth medium (step 1.3). Transfer sterile resin composite specimens (e.g. PF, TP) to sterile 12-well plates. Add 2.5 ml of diluted culture medium (step 3.2) to wells for treatment (mouthwash) and control groups. Add 2.5 ml of sterile uninoculated biofilm growth medium to sterility control wells. Grow the biofilms under microaerophilic conditions. Place plates on a shaker at 100 rpm inside an incubator at 37 °C for 24 hr. After 24 hr, aseptically aspirate medium from all wells and wash twice with sterile PBS (step 1.4; 2.5 ml/well), aspirating the PBS after each wash. Replenish 2.5 ml of fresh biofilm growth medium in each well and incubate for an additional 24 hr under identical conditions as the previous step, for total biofilm growth time of 48 hr. In lieu of the above steps, biofilms of other species could be grown on substrates using established protocols. Aspirate medium after biofilm growth is complete. Add 2.5 ml Biotène PBF (BIO) or Listerine Total Care (LTO) mouthwash, or other treatment modality, in wells for the treatment groups, and add 2.5 ml sterile ultrapure water to the control group well. Immerse specimens for 60 sec, as per manufacturers' instructions, while agitating plates on an orbital shaker at 150 rpm. Immediately aspirate both the mouthwash and ultrapure water from the wells. Wash the specimens 5x for 15 sec per wash with sterile ultrapure water on the orbital shaker at 150 rpm, aspirating water after each washing step. In lieu of the above steps, other antibacterial agents could be tested using established protocols. Prepare the stain dilutions for biofilm analysis. Prepare a 5 mg/ml stock solution of Concanavalin A, Alexa Fluor 647 conjugate (AF) in 0.1 M sodium bicarbonate pH 8.3. Store at -20 °C in single-use aliquots for several months because freezing and thawing is discouraged. Using this AF stock solution, prepare a 250 μg/ml dilution in TC buffer. Prepare a 10 μM dilution using the 5 mM Syto 9 stock solution (SY), as provided by the manufacturer, in TC buffer. Store the remaining SY stock solution at -20 °C for several months. Prepare a 10x dilution using the 5,000x Sypro Red stock solution (SR), as provided by the manufacturer, in sterile ultrapure water. Store the remaining SR stock solution at -20 °C for several months. Wash all biofilms 2x with TC buffer (2.5 ml/well) using a hand-swirling motion, allowing the second wash to remain in the plate for 30 min at room temperature. Aspirate. Place a 50 μl drop of AF stain on each biofilm specimen. Stain for 30 min at room temperature, protected from light. Wash 2x with TC buffer (2.5 ml/well), aspirating after each wash. Finally, place a 50 μl drop of SR stain on each biofilm specimen. Stain for 30 min at room temperature, protected from light. Wash 3x with sterile ultrapure water (2.5 ml/well), aspirating after each wash. Transfer the specimens to a 6-well plate, placing one specimen per well in 6 ml sterile ultrapure water to facilitate confocal microscopy. Acquire images of each component (stain) within biofilms of the treatment and control groups using a confocal laser scanning microscope settings shown in Table 1. A 63X dipping lens with a 0.9 numerical aperture that has a working distance of 2.2 mm was used in this study. Table 1. Confocal Laser Scanning Microscope Settings. Set the scan size to 250 μm x 250 μm and a minimum pixel resolution of 512 x 512 to acquire CLSM images at a resolution adequate for quantitative analysis. Use the SY stain to set the top and bottom points of the biofilm image stack, then set the z-step to be adequate for quantitative analysis (0.6 μm for this study). Before collecting a scan, optimize the image and stain parameters (i.e. PMT voltage and offset) using the QLUT option. A color look-up table was used to assign pseudo-colors to each stain (green for SY, red for SR, and blue for AF) in order to make each biofilm component more distinguishable in the 3D reconstruction. Collect CLSM images at 400 Hz using sequential scanning in the "between stacks" mode to optimize capture of images of multiple stains within the same biofilm. Analyze the CLSM images collected using image analysis software for biofilms. The following steps describe the use of ISA3D software12 to calculate the structural parameters of the biofilm images collected. Copy CLSM image files for each biofilm to the Images folder, as specified in the software's manual. Ensure that the naming convention for CLSM files required by the software is followed. The software permits analysis of files within subfolders in batch mode, thus facilitating analysis of treatment and control group biofilms in the same run. Enter x-, y-, and z-axis dimensions of CLSM images in the dxy and dz fields of the main dialog box. Select threshold and distance mapping settings, as described in the software's manual (Otsu and Quasi-Euclidean were used for this study, respectively). Input a suitable name for the results file, and then run the program. A results file will be produced in the ISA folder. View the results file to obtain values for twenty 3D structural parameters12 such as biovolume and mean biofilm thickness (measured in this study) that quantify the 3D distribution of each component (stain) within the biofilm. Create a reconstruction of overlaid components (stains) within each biofilm using image analysis software. The following steps describe the use of Volocity software to create 3D reconstructions. Create a library for each biofilm by copying CLSM image files into the software, as described in the manual. 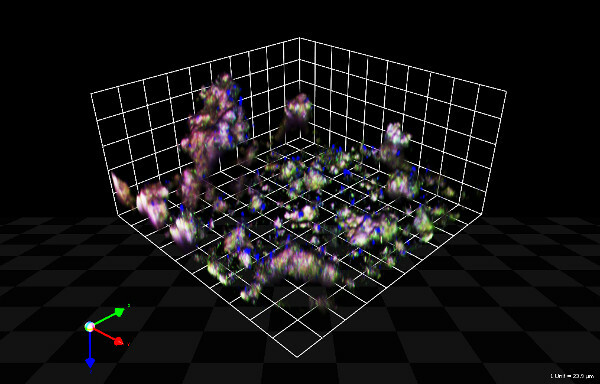 Use the 3D Renderer menu option to produce a reconstructed 3D image from the CLSM images of each biofilm (HR Opacity format was used for this study). Rotate the 3D image to orient all of the biofilms in a similar manner with regard to the x-, y-, and z-coordinate axes. Capture a snapshot of the correctly oriented biofilm reconstruction, and then export the snapshot in TIFF, JPEG or other suitable format. Perform visual analysis of the concurrent distribution of EPS, proteins and nucleic acid components within biofilms on the reconstructed images. Use Pearson's correlation coefficient and Manders' overlap coefficient to perform a colocalization analysis of multiple biofilm components (colocalization was not measured in this study). Use separate mixed models statistical analyses to compare mean values of structural parameters between mouthwash and control groups (α=0.05). For this study, SAS software was used to perform the statistical analysis. Representative results for the treatments (mouthwashes) and untreated control group are shown in Table 2, and Figures 1 and 2. Table 2 displays the mean and standard deviation values of biofilm structural parameters biovolume (μm3) and mean biofilm thickness (μm) that were calculated using ISA3D software. Structural parameters of biofilms treated with mouthwash that differed significantly from those of biofilms in the control group (p<0.05) have mean and standard deviation values highlighted in red. The results of the mixed models statistical analyses demonstrated that mouthwash BIO produced biofilm structures that differed significantly from the control (p<0.05) on both resin composites, whereas mouthwash LTO did not produce significant differences (p>0.05) on either resin composite. The results clearly show that the cellular and extracellular biofilm components remaining after the two mouthwash treatments differed. It should also be noted that the S. mutans biofilms grown on the two substrates (PF and TP) differed in 3D structure even though they were grown under similar conditions and both substrates were polished with similar abrasives. The concurrent distribution of EPS, proteins and nucleic acid within biofilms can be visualized via the 3D reconstructions generated using Volocity software. Figures 1 and 2 demonstrate representative reconstructions of control group biofilms grown on PF and TP resin composites, respectively. The blue stain represents EPS within S. mutans biofilms, the green stain demonstrates nucleic acids, and the red stain shows proteins. The intervening space may be occupied by water or other nonfluorescently labeled biofilms components. Figure 1. A representative 3D reconstruction of S. mutans biofilm grown on PF resin composite in the control group (not treated with mouthwash). Concurrent overlay of the three stains within a single biofilm permits the simultaneous visualization of EPS (blue stain), nucleic acid (green stain), and protein (red stain) components within S. mutans biofilms. (1 Unit = 24 μm). Click here to view larger figure. Figure 2. 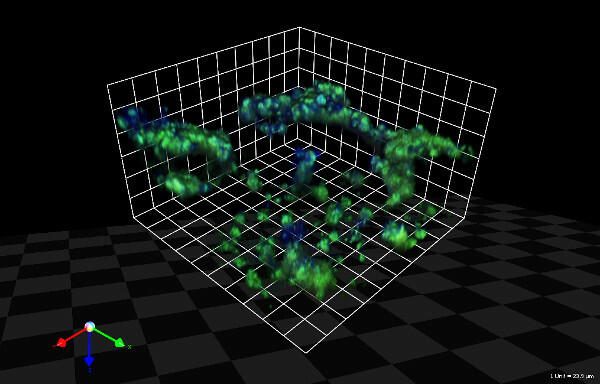 A representative 3D reconstruction of S. mutans biofilm grown on TP resin composite in the control group (not treated with mouthwash). Concurrent overlay of the three stains within a single biofilm permits the simultaneous visualization of EPS (blue stain), nucleic acid (green stain), and protein (red stain) components within S. mutans biofilms. (1 Unit = 24 μm). Click here to view larger figure. Table 2. Mean and standard deviation values of Biovolume (BV) and Mean biofilm thickness (MT) of biofilms treated with BIO or LTO, or left untreated (control group). Structural parameters of biofilms treated with mouthwashes that differed significantly from those of biofilms in the control group (p<0.05) have mean and standard deviation values highlighted in red. The acquisition of CLSM images has to be performed in the manner and format necessary for the quantification of biofilms and for colocalization analysis, such that the distribution of signal intensity in each image is a reliable representation of the distribution of each fluorochrome in the biofilm stack. The signal intensity should be distinguishable from noise and background10,11, unaffected by autofluorescence from the substrate, and having minimal bleed-through due to spectral interference between the fluorochromes used11. Noise is an inevitable limitation of fluorescence microscopy11, and image quality can sometimes be limited for technical or logistical reasons. Identification of fluorochromes with minimal spectral overlap is critical to the success of this method, but can be complicated. Furthermore, the quantification of multiple fluorochromes poses a multifactorial problem. Therefore, it is not surprising that very few investigations have successfully quantified the concurrent distribution of more than two components within the structures of biofilms. The objective of this study was to report a methodology consisting of distinct but interconnected steps for the quantification and comparison of the concurrent 3-dimensional distributions of three cellular and extracellular components within biofilms. The biofilm growth assay described permits biofilm growth on relevant substrates and produces biofilm structures that are reproducible, as demonstrated by the results reported in Table 1. The combination of novel simultaneous staining of EPS, proteins and nucleic acid components with the measurement of 3D biofilm structural parameters results in quantifiable distributions of components within biofilms. Qualitative visual analysis of the concurrent distribution of EPS, proteins and nucleic acid within the biofilms is possible via the reconstruction of overlaid stains within each biofilm. The ISA3D software12 contains several unique structural parameters such as fractal dimension, homogeneity, and biofilm roughness coefficient in addition to traditionally-measured parameters such as porosity and biofilm thickness to enhance quantification of the 3D structures of biofilms. Statistical analysis of the biofilm structural parameters facilitates relevant comparisons of biofilms under specific experimental conditions such as antibacterial/antifouling efficacy (e.g. after treatment with mouthwashes) or over time (temporal effects). This methodology efficiently and successfully quantified and compared the concurrent 3D distributions of three major components within S. mutans biofilms that were grown on relevant substrates, thus overcoming two challenges to the simultaneous assessment of biofilm components. This method can also be used to determine the efficacy of antibacterial treatments or antifouling measures against multiple biofilm components, as shown using mouthwashes in this study. Furthermore, the majority of the protocols described above can be replaced with protocols for the fabrication of relevant substrates and biofilm growth assays of relevant microorganisms. Therefore, this method has broad application because it facilitates comparison of 3D structures/architecture of in vitro and in vivo biofilms in a variety of disciplines including the medical, dental, geological and marine sciences. The authors declare that they have no competing financial interests. Production and Free Access to this article is sponsored by Leica Microsystems. Funding for this study was provided by the National Institutes of Health/NIDCR grant 1R15DE019566-01A1. Dr. Jim Henthorn (OUHSC Flow and Image Cytometry Laboratory) is acknowledged for providing technical assistance with confocal laser scanning microscopy. Dr. Fernando Esteban Florez (Department of Dental Materials) is acknowledged for providing technical assistance during the filming of this video. Costerton, J. W., Stewart, P. S., Greenberg, E. P. Bacterial biofilms: a common cause of persistent infections. Science. 284, 1318-1322 (1999). Hall-Stoodley, L., Costerton, J. W., Stoodley, P. Bacterial biofilms: from the natural environment to infectious diseases. Nat. Rev. Microbiol. 2, 95-108 (2004). Yang, Y., Sreenivasan, P. K., Subramanyam, R., Cummins, D. Multiparameter assessments to determine the effects of sugars and antimicrobials on a polymicrobial oral biofilm. Appl. Environ. Microbiol. 72, 6734-6742 (2006). Klein, M. I., Xiao, J., Heydorn, A., Koo, H. An analytical tool-box for comprehensive biochemical, structural and transcriptome evaluation of oral biofilms mediated by mutans streptococci. J. Vis. Exp. (2011). Conchello, J. A., Lichtman, J. W. Optical sectioning microscopy. Nat. Methods. 2, 920-931 (2005). Robinson, J. P. Principles of confocal microscopy. Methods Cell Biol. 63, 89-106 (2001). Neu, T. R., Kuhlicke, U., Lawrence, J. R. Assessment of fluorochromes for two-photon laser scanning microscopy of biofilms. Appl. Environ. Microbiol. 68, 901-909 (2002). Wood, S. R., et al. Architecture of intact natural human plaque biofilms studied by confocal laser scanning microscopy. J. Dental Res. 79, 21-27 (2000). Chen, M. Y., Lee, D. J., Tay, J. H., Show, K. Y. Staining of extracellular polymeric substances and cells in bioaggregates. Appl. Microbiol. Biotechnol. 75, 467-474 (2007). Zinchuk, V., Zinchuk, O., Okada, T. Quantitative colocalization analysis of multicolor confocal immunofluorescence microscopy images: pushing pixels to explore biological phenomena. Acta Histochem. Cytochem. 40, 101-111 (2007). Dunn, K. W., Kamocka, M. M., McDonald, J. H. A practical guide to evaluating colocalization in biological microscopy. Am. J. Physiol. Cell Physiol. 300, C723-C742 (2011). Beyenal, H., Donovan, C., Lewandowski, Z., Harkin, G. Three-dimensional biofilm structure quantification. J. Microbiol. Methods. 59, 395-413 (2004).